Living up to its name, this outlet of Nukkadwala is actually around the corner. Located amid corporate offices and agencies in the Cyber City area, it's an escape for those who work around there. Penning down my exact feeling when i saw the menu - I wanted to try out each and every dish, right there. Wonder Why?? Imagine a place, all the best sellers under one roof. It's a one stop joint where you can explore famous and sumptuous hot selling dishes from around India. So, we began our food journey by ordering Mango Lassi, Meerut Shikanji, Kutchi Dabeli, Keema Pav/Samosa, Amchi Vada Pav, Amritsari Chiken Burger and the Mutton Chop Burger. From the streets of Gujarat - the Kutchi Dabeli, was an amazing start. 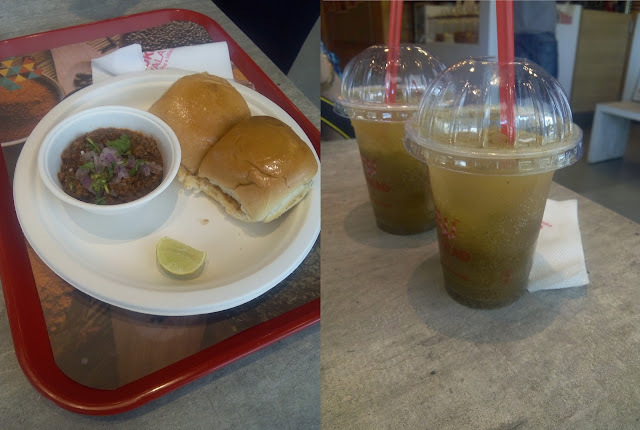 The Keema Pav and Amritsari Chicken Burgur were delicious as well. Only the Mutton Burger was somewhat of a let down, but hey almost everything else was absolutely great.. The Keema Samosa made up for the Mutton Burger. The Mango Lassi was very balanced and refreshing, but you surely must try the Meerut Shikanji. It was so good that we ordered another round after eating all the below. The ambience over here is such that you get a retro yet contemporary feeling, which is quite rare. The best part is that, this place will make you forget how old you are. Surely, a place where you can grab a bite with whomsoever you want..
Building 5, Tower A, Ground Floor, DLF Cyber City, Gurgaon..